These cookies are amazing but SO addictive! 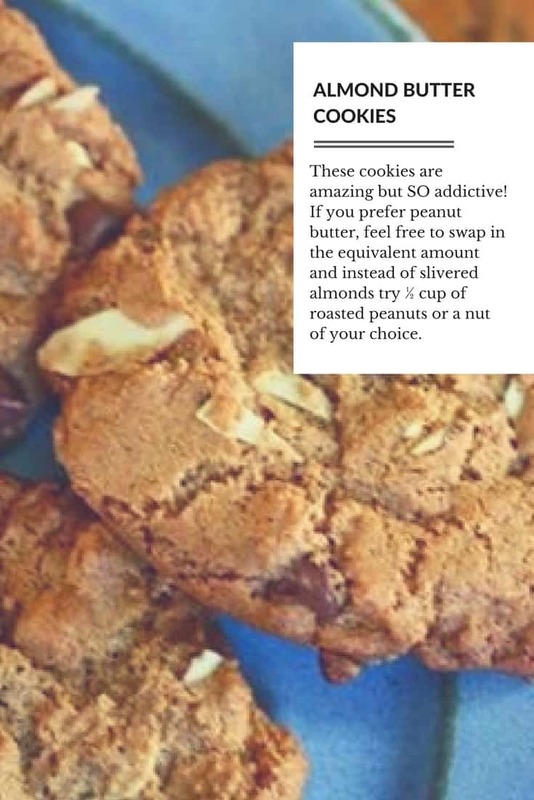 If you prefer peanut butter, feel free to swap in the equivalent amount and instead of slivered almonds try 1/2 cup of roasted peanuts or a nut of your choice. Add egg, baking soda, maple syrup, vanilla and salt and mix well. Stir in the almonds and chocolate chips. Using a teaspoon, scoop out small, walnut-sized amounts of dough and roll them in your hands to form a ball. Place on cookie sheet about 1 inch apart. Bake 10 to 12 minutes, until lightly browned. Cool for 5 minutes. I tripled the recipe! I make them smaller in size, they spread out too much. Cooked them for 10 minutes which was perfect. *Chef’s Note: If using soaked, dehydrated almonds, you may need to add a little oil. I added 2T grapeseed oil and that was perfect.